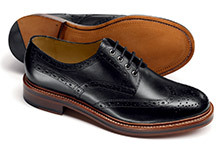 Charles Tyrwhitt’s selection of brogue shoes are carefully crafted, superbly comfortable and unequivocally stylish. With their distinctive decorative perforations (the pattern known as "broguing") Tyrwhitt's men's brogues are smart enough for the office, but will also look the part at the pub. Our on-trend men’s shoes collection also includes business shoes, casual shoes and Oxford shoes. 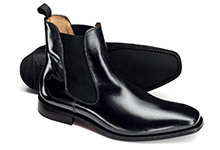 Chelsea boots have elasticised sides that stretch and allow you to slip the shoes on or off. They are ankle high and typically close fitting. 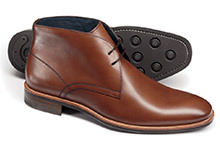 Chukka boots are ankle-high and lace up using 2-4 pairs of eyelets. Ours are made from premium leather and suede. 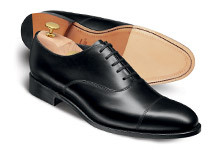 Derby shoes have open lacing (unlike Oxfords which have closed lacing). The shoelace eyelets are sewn on top of the uppers, giving a slightly more relaxed look. 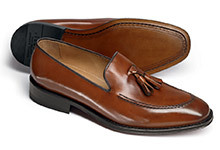 Loafers are slip-on leather shoes with a broad flat heel. 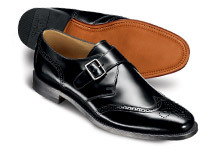 Monk shoes are fastened with a buckled strap rather than laces. They're less formal than Oxford shoes, but smarter than brogues or Derby shoes. 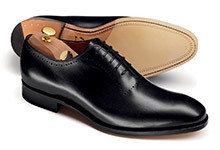 Oxford shoes have enclosed lacing where the shoelace eyelets are stitched underneath the top section of the shoe. This creates a cleaner, more formal look. 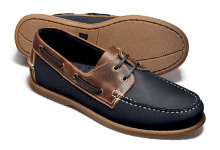 Our boat shoes have a leather upper with a waxy finish, and hard-wearing rubber soles. Our leather work trainers are superbly comfortable, yet still smart enough for the office. They have a hardwearing rubber sole. 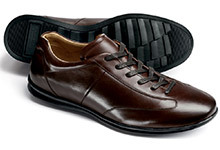 Wholecut shoes are made from a single piece of high quality leather. They have virtually no stitching, giving them a flawless, formal look. Driving shoes are slip-on shoes, normally made from suede. 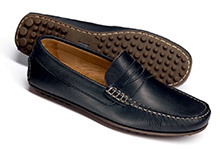 They have a lightweight moccasin construction with little rubber nubs on the sole for extra grip.